Any experiences with Torino FC? Looking at the squad, they actually have a good team! I know it may be hard to hold on to Belotti, but I really like the look of the squad. So what do you say, any experiences? 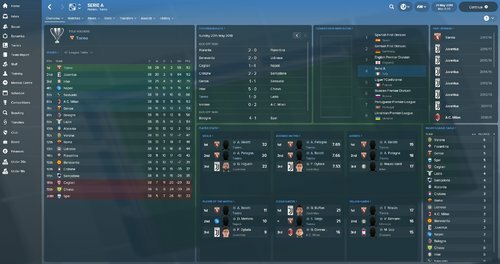 Would it be possible to achieve Euro League qualification in the first season? 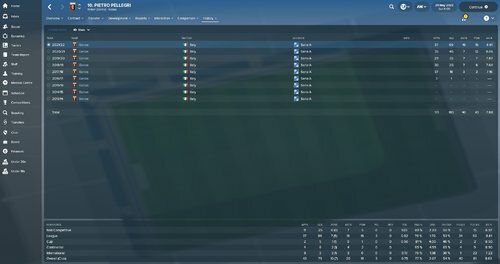 In my Italy save the AI has managed to hang onto Belotti well into the second season (with no european football) so would say you have a great chance. the man is an absolute goal machine too. Are you finishing your Juve save pal? I deleted it waiting the 18.2 and now I restart another even if there is still the bug that if you remove the budget in the first transfer window you don't get budget not even in winter! I decided to start with Torino FC. 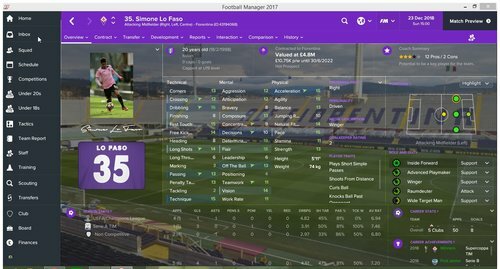 Three players has come in: Lucas Romero from Cruizero for £4,5 mil, Yuto Nagatomi from Inter and Adama Traore from Monaco, both on season long loans. Nagatomi has a buy-out clause of £2,9 million. Only outgoing transfers has been some youngsters going out on loan. Pre-season has been good, 2 wins and 2 draws, and a win over Empoli sent us through to the 4th Qual round of the TIM Cup against Spezia. Season opener is going to be very rough, away to AS Roma. 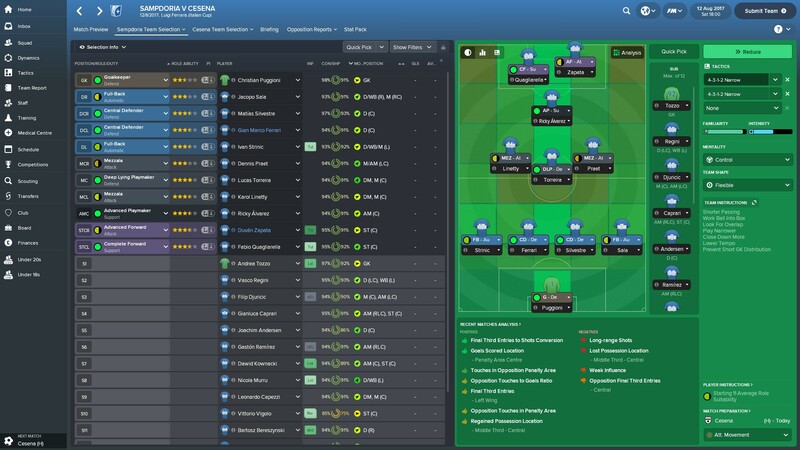 Currently in January 3rd season with Inter and it's looking tougher to keep hold of my top players. Joao Mario has joined Man Utd for 54m so need a replacement. Icardi has handed in his transfer request and Kondogbia wants to join Barca. It's all going off haha! Recommendations for as good replacements? Started with Chievo. Sitting in 8th after 13 games. No first team signings during summer, but I am looking for lots of players to replace aging starters during the next two windows. 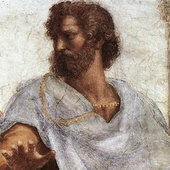 Picked up my Genoa save again, Pellegri has become imo the greatest striker of all time, Genoa solidify their position as the best team in the world and announce the building of a new £200m stadium named after me. Not as good I'm afraid, he's pretty much a squad player. I did try to field him first pick like Pellegri at the start of the save, but it quickly became clear I was going to have to play 1 up top and he couldn't get in the team ahead of Ricci/Centurión on the wings. Just finished my second season with Benevento. 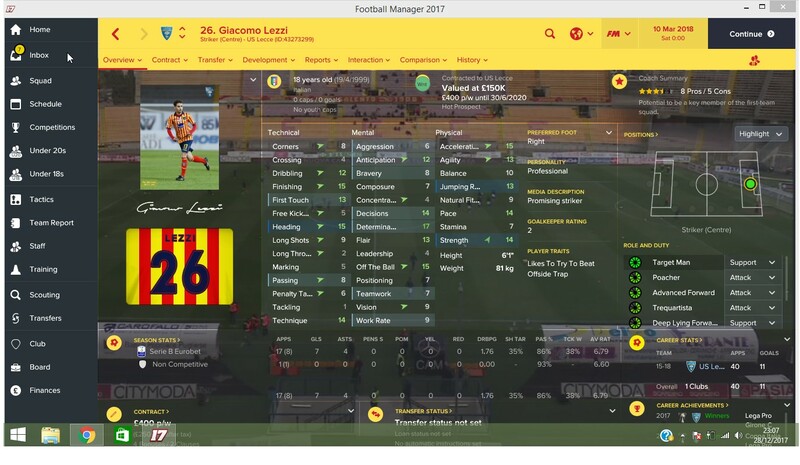 In my first season I sold our best player, the right winger for 3 million euros and bought Kostas Galanopoulos on loan from AEK as backup BWM and Nocerino on a free transfer in the January season. I finished comfortably 9th. Now with the TV money and steady income throughout the year, I had the opportunity in the summer to strengthen the team. Danilo Cataldi renewed his loan from Fiorentina but instead of paying his salary of 2.2 million euros, it was reduced to 1.6million euros, still the highest paid player at Benevento. 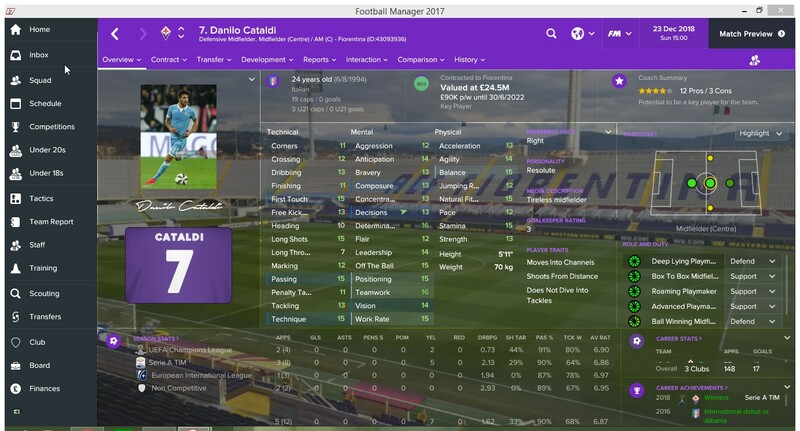 Alessandro Deiola from Cagliaro for 3.5 million euros. A promising central midfielder with 20 Determination and decent physical stats. Transfer-listed Joel Pohjanpalo from Leverkusen for 1.7 million euros as a backup striker for Massimo Coda and strengthening our wings. His compatriot, Teemu Pukki signed as a free transfer to supplement Pohjanpalo mainly in the wings but occasionally as a striker (noting his 1 Bravery!!!). Pukki immediately became the highest valued player at the end of season 2, being valued at 10.5 million euros. A third Finn, Sauli Vaisanen came from SPAL as a backup centre back for 800,000 euros. 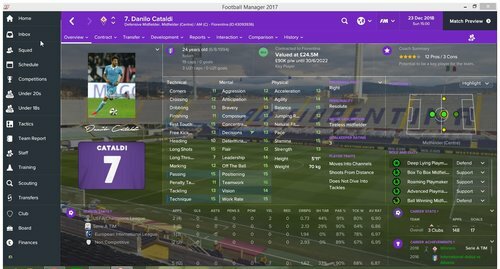 The final important signing was the 2-year loan of promising left back Federico Giraudo from Torino with a 6,000 euro monthly pay!! I finished 2nd season in 4th place, after being champions at the end of round 1. A bad slump followed, and we secured 4th place quite luckily with results going our way for Inter and Napoli who were right behind me. Juventus were champions again, followed by Milan and Fiorentina. 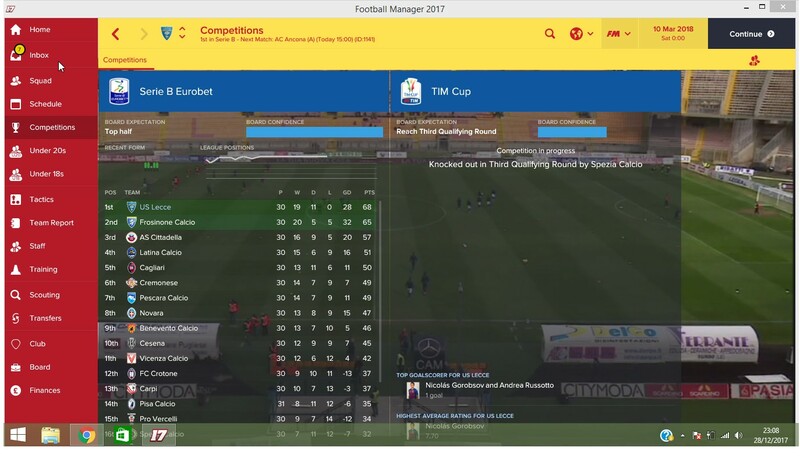 I also won the Italian Cuo after a surprise quarter-final 0-1 away at Juventus, followed by an easy draw against Spezia in the semi-finals and Cremonense in the Final. I am punching well above my weight but now have transfers that need to be made with an assured place in the Champions League group stage. I also will only have about 10-15 million euros left for both transfers and wages, with an extra amount to follow at the end of August from the Champions League money. 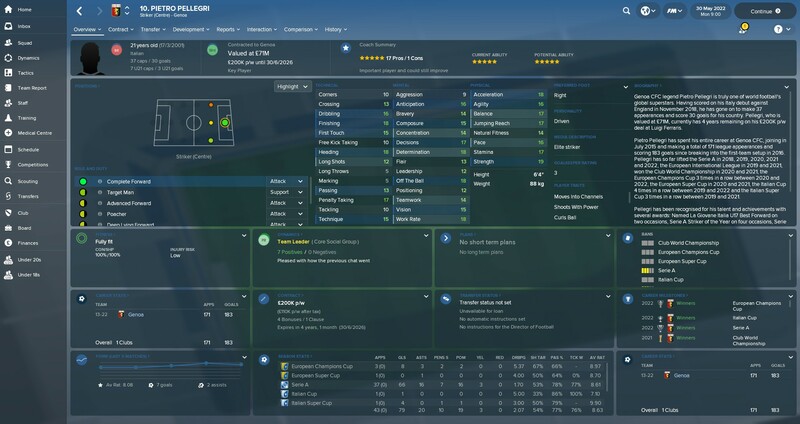 Who should I sign and what should I do? I need a goalkeeper to replace Brignoli who was loaned from Juventus for 2 seasons and Belec. They were both rotating but need someone better. My wingers have generally been woeful, and I need at least 2 CMs (ball winning or box-to-box midfielder to replace Danilo Cataldi and give breathing space to Chitsbah). I will need a taller RB and a top Complete Forward to compete with Massimo Coda. Any thoughts on given the budget and the priorities? 2 CM, 1 ST, 1 GK and 1 RB. I play a 4-3-2-1 with 3 CMs, 1 IF-S and 1 WS-S and CF-S. I took over Juve at the start of 4th season after 3 year spell in Sporting. Can you give me a list of young italian players who should be Juve quality by now. I have a few Italian players of quality in the squad so I'm looking to bring more in. @luka_ after 4 years it's hard since the 16yo are 20yo. Btw do you have some role preferance? I didn't check the potentials then maybe some are bad players. I second Fiorentina one of the most satysfying careers i have played on FM classy city, the kit, always the nearly men and the fact they despise Juve just adds the challenge of dethrowning them and bringing the title back to a city that desperately craves it. I have However got another interesting save going at the moment that i've been meaning to do for a while and that's US Lecce. They're is a huge culture and class difference in Italy that is reflected in Football between the north and the south and except for Napoli there are no real competitive teams in the top division, Bennevento are the whipping boys this year. and the south are really looked down upon by the richer cities and mocked regularly, That doesn't mean though that there aren't 'Big' teams in the south in terms of supporter/ultras. There are probably 4 standouts in Palermo (awesome kit) crazy owner, great youth propects, Catania (hideous badge) Bari (60,000 stadium) and Lecce who's kit is both crap yet strangely appealing, They have crazy fans too and the largest in terms of season ticket holders despite playing in serie C, so i thought what a worthy team to take back to the top and restore some pride. 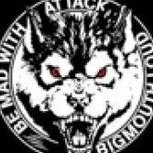 We are so far undefeated with 10 games left and roaring back to Serie A where the real fun begins, The wolves are coming. 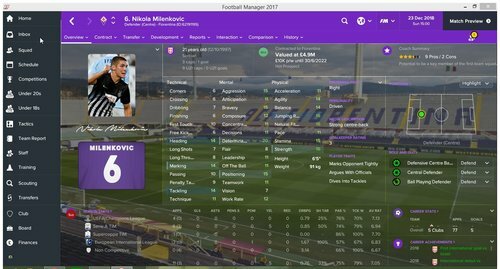 Any realistic transfers at the start of the save? 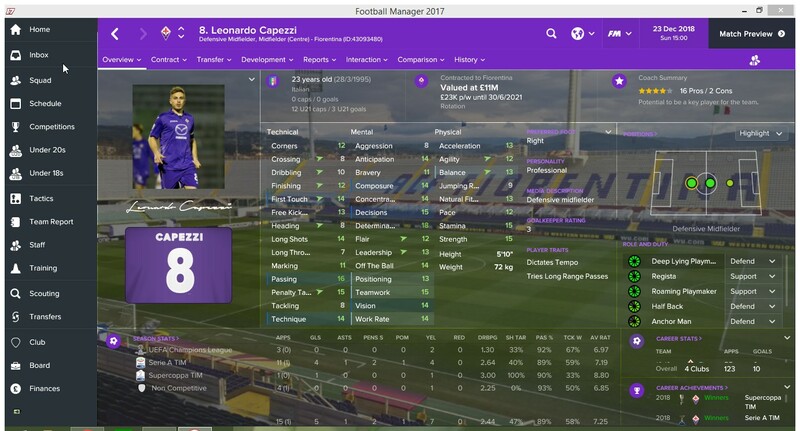 Fiorentina are a bit of a goldilocks team in that you don't have a ready made squad like the big guns but they have enough power to atttract very good players if you can afford them, and if like me you want to raid the academies of Italy for a potential future super squad then you can snap them up with ease. 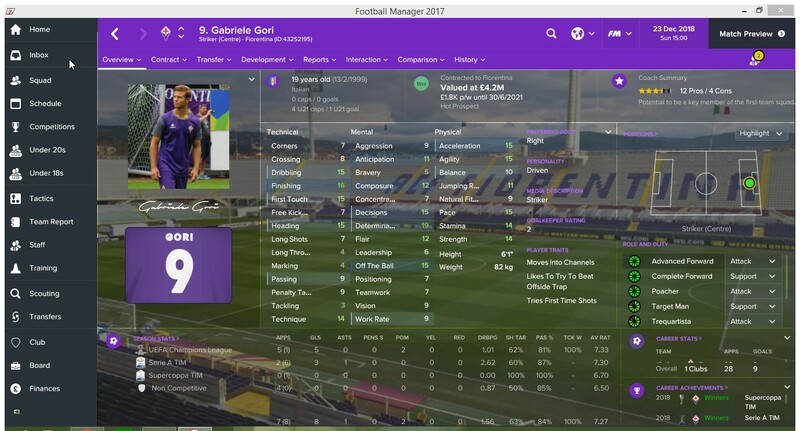 I have never managed Fiorentina before, I am going to give them a shot after I get bored of my Liverpool save, can you get Gabriel Batistuta as DOF or Assistant Manager etc, I would want the legend involved in the club in some way. 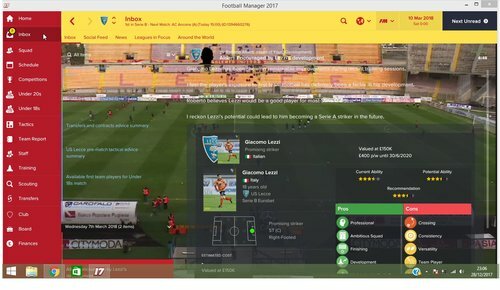 Half way through my first season as Roma, no budget in the first transfer window, and it is tough! My side is unpredictable: some real Jekyll and Hyde performances! Cruising one half, then don't show up in the second half! Looking at selling a few players in January to raise funds to buy some youngsters for future years: Kolarov, Castan and Bruno Peres are all for the chop if i can find buyers! Playing a 4-3-3 DM currently. Any idea on some bargain buys/future signings?? 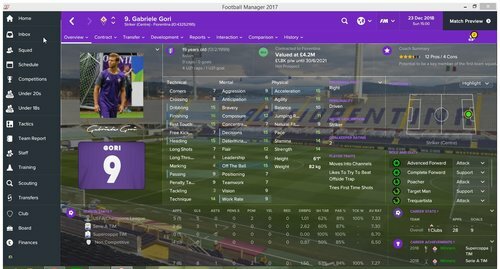 Currently in 4th season with Fiorentina, 1st team as follows. Despite 4-3-1-2 being much more functional with the original squad (no decent wingers and plenty of CMs), there's simply no way, as far as my tactical acumen goes, to make it work. It's passable against stronger teams, but I went nowhere against relegation candidates for some reason. Who on the left and right? Early in season 2017-18, Sala on the right and Dodô/Strinic on the left. Then in January 18 I signed a rather obscure RW from the Norwegian league and started to employ Caprari out of position (while retraining him). In summer 2018 I bought Gnabry, then loaned Ryan Kent (from Liverpool) and kept on rotating the previous options. All in all Caprari as RW and Gnabry as LW worked pretty well. In my first season managing Samp using the 4-3-1-2 narrow formation with success. 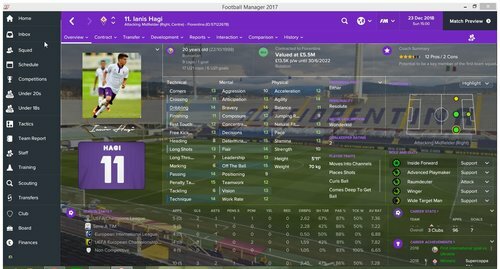 The first screenshot is my home tactic. The second for away games to Juve, Napoli, Roma, Lazio, Inter, Milan and Fiorentina. The third for the rest. 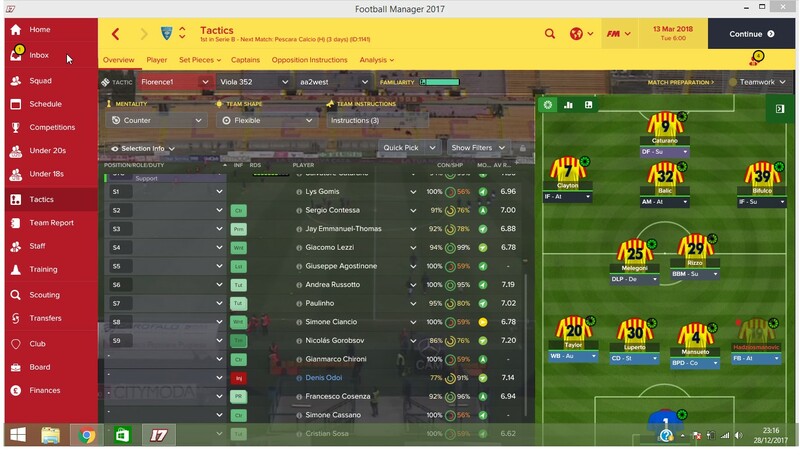 I played 8 pre-season friendlies 4 home and 4 away against non league teams to ensure morale was high before the league started. Thanks for posting, I really needed this! Where did you finish in the league? Do you have individual instructions? 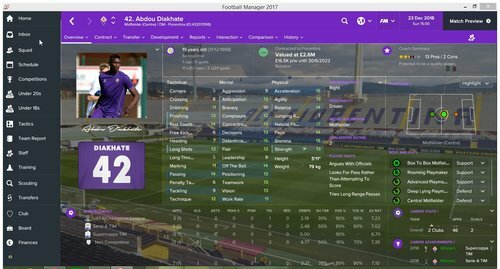 Do you plan to sell/buy some player? No worries. 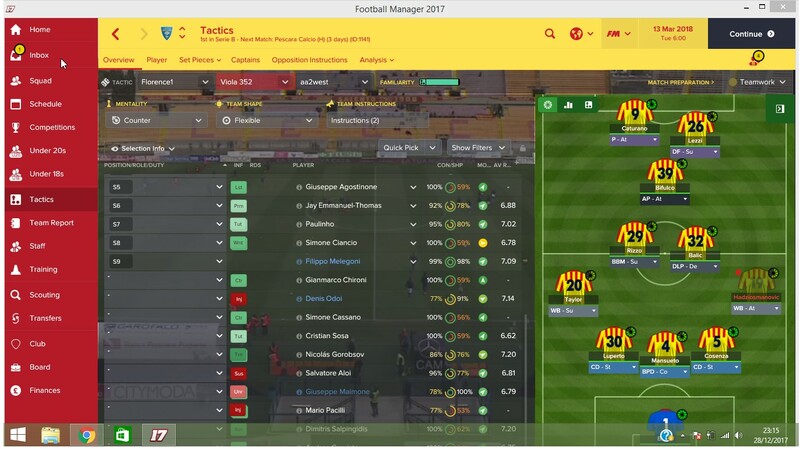 4-3-1-2 is my favourite tactic and in previous FM editions I have won consecutive Serie A titles and the Champions league. I have no individual player instructions as I like the players to have their own PPM’s. Fullbacks will run with ball down left/right. Centre backs stay back at all times and mark opponents tightly. Midfielders try killer balls often. Attacking midfielder will run with ball often and try killer balls often. Complete forward will shoot with power and try killer balls often. Advanced forward will run with ball though centre and place shots. In my save I’m currently at the beginning of January and still first. I'm confident I will win the league as I'm out the Italian Cup and there is no fixture congestion to worry about. Quagliarella and Zapata don't miss many chances but the weak links are Viviano and Alvarez but that is why they are three stars! PSG have made a bid of £24M for Torreira but I have renegotiated it to £30M. If he goes I will replace him hopefully with Manuel Locatelli. I buy only Italian players so my Samp squad will be all Italian by season 4. In season two I plan so sign either Alessandro Bastoni or Riccardo Marchizza to replace Ferrari as he is not worth signing outright for £12M. 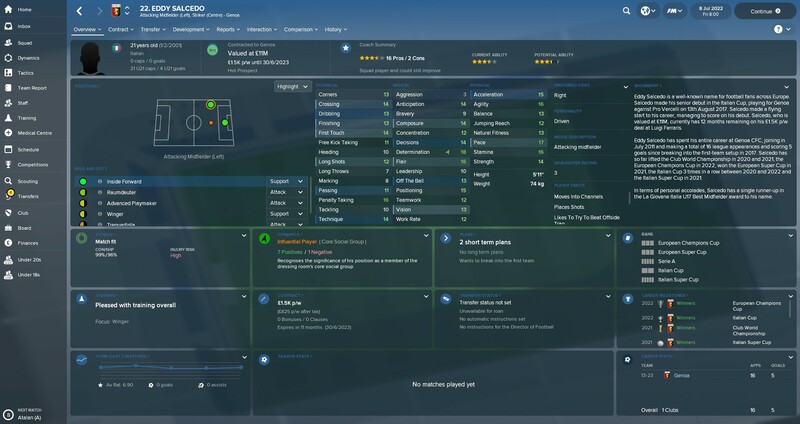 I will also look at signing Felice D'Amico who will be my first choice attacking midfielder by season 4. I’m sure I will receive bids for Linetty and Praet in the summer so I will look at Nicola Barella and Alberto Grassi to replace them. In Fm18 I am finding that clubs are bidding for my players regardless of ability as I received a bid from Napoli for Sala. In FM17 I had to offer to clubs before a transfer bid was received for any of my title winning squad. Also the future transfers is incorrect as Schick is to be bought by Roma for £8m but there should be an extra €20m to be received in 2020. @mjg really thanks for your reply and impressive results! And how do you plan to replace Viviano and Alvarez? Do you use some particular tactic for corners/FK? Overall is a slow team an I find difficulties! I've tried both Torino FC and Fiorentina... But Italy is just "too easy". 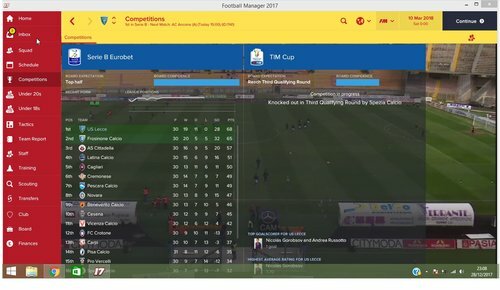 Won the league with both teams within the first two seasons. Kinda killed both saves. I have not altered the setting for corner/ free kicks. For Viviano as Udinese are third bottom and looking to be relegated Alex Meret would be perfect. As for Alvarez I will hopefully sell him in the January 18 window and rotate Ramirez, Djuricic and Capriari until D'Amico if purchased is a three star player. The Samp youth team have three excellent prospects, Gergely Hutvagner, Mario Ferreira and Ibourahima Balde. When they are 18 I plan to loan them as a first team player to Italian B or C teams with Great/Superb training facilities. 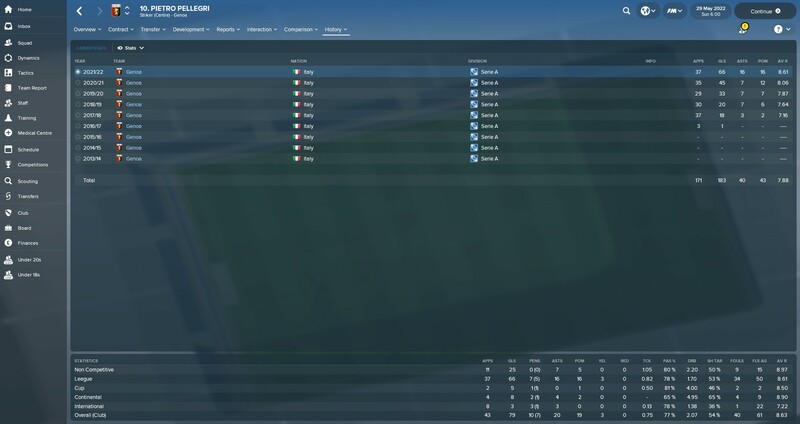 I find using only Italian players a better challenge as it limits your choice and they are far more expensive to buy which makes for a longer save! Another tip is to have three of your best prospects in the first team squad and make them available for the U18/20 as the first team coaches are far better. I was thinking of trying both these teams but maybe not now. Just finished 3rd with Wolfsburg 1st season. Always come back to Italy though. Sampdoria sounds and looks fun! Anyone had any luck with Lazio? Udinese is another one really interesting, many good young players and a staff >>> Sampdoria's one. I just didn't like the commitment you have with Watford because it has the same president. I want to start a career with all attributes hidden and choosing players only from their statistics on the pitch, the reports and watching them play. It can become too easy when because as your team improves i find the rest get weaker because the big guns in europe start stealing the best players, what i did was go on editor and give the top 5 300m each and then it reversed it and they all built really hard teams. Unfortunately the cpu transfers still have a lot to improve. Totally agree with these comments about ai getting weaker. 4th season with Inter and Juventus have Pep in charge, finished outside top 4 and signed the likes of Sarabia from Sevilla, lost all there stars and it became less competitive. I found in last year's version Lazio's funds were really poor, think that's a common thing in Serie A, apart from the Milan clubs and Juve. Anyone any experiences of managing Fiorentina? Starting with them when Im home, by my reckoning they have 6 pretty decent to excellent youth prospects? Would like to know more about positions that need strengthining, tactics , style of play etc? Yeh I see where your coming from. In the prem with the top teams the transfer budgets/wages become ridiculous. German is slightly less but even with Dortmund 2nd season I got 95m. Much more rewarding having a smaller budget and trying to find the less known players. Fiorentina have a nice squad to start with, some big talents at the club. 3-5-2 used to be best formation for them in previous versions but 4-2-3-1 is perfect for there players in Fm18. There fullbacks, right especially, look poor, upgrade there but they are already in the red with wages from the start. I'm torn between Fiorentina and Lazio personally. 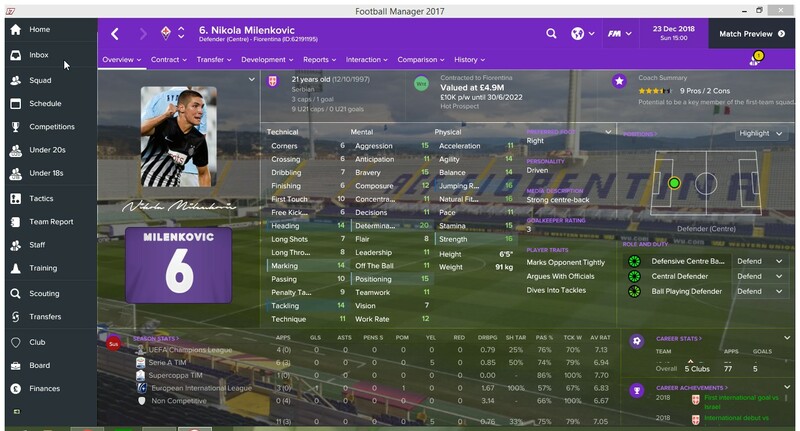 Hagi,Milenkovic, and Chiesa are sure wonderkids top top class and there are 4 or 5 others who are maybe wonderkids. Decided to give Torino FC another go... We'll see how it turns out this time around. 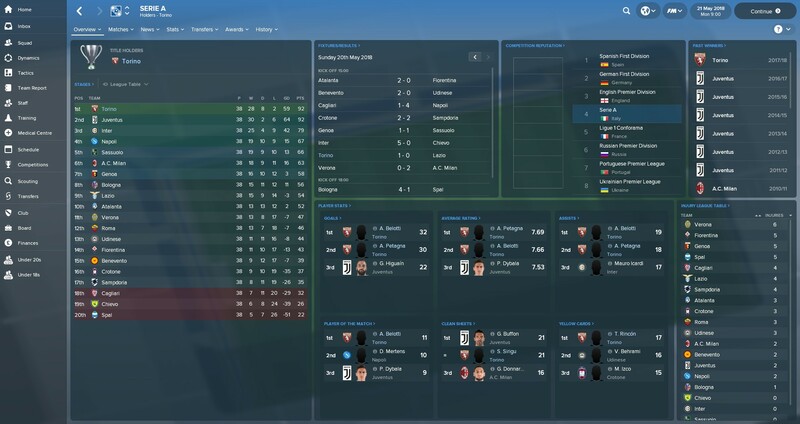 Torino are decent, closest title race ever and I learned the league is decided on head to heads, heh. Congrats on winning the title mate. I can see you raided Atlanta for Petagna. How much did he cost? Thanks, he was a deal rising to £17.5m, I think it was about £10m upfront. Well worth it, perfect strike partner for Belotti imo.